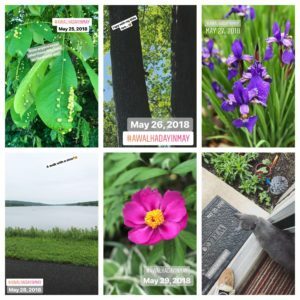 On the first day of May, I headed out the door determined to shake off the “blah”. Spring had been slowly showing up here and there teasing us with sunshine and green tints all around. As I walked, all my senses were drawn to the awakening beauty of nature around me…Freshly cut grass and its amazing smell…The birds loudly chirping and switching branches creating a happy commotion… That crisp spring breeze as it whizzed by gently kissing my cheeks and filling my lungs with freshness of air… Everything around me screamed–SPRING! 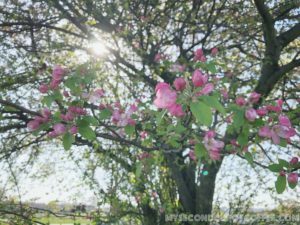 When I was looking through my camera roll later that day, I was suddenly inspired to go for a walk the next day again and try to capture a different tree in bloom I had spotted that day…and maybe one more day that week…if I could. And then it dawned on me: well, of course, I could!! Why not go for a walk every day? What’s stopping me, really? I am in good health, and I have the time. 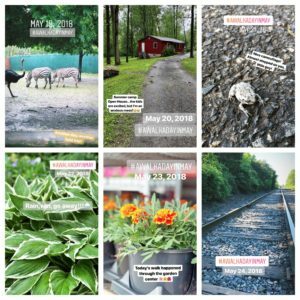 Why not go on daily walks in May and try to capture something different that catches my eye each day? 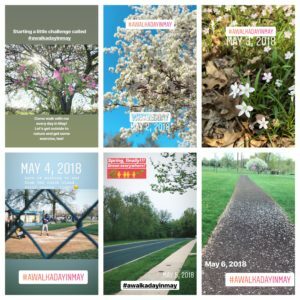 And so, with that idea in mind, I shared it on my Instagram page and went forth with my walking challenge, tagging it with #awalkadayinmay. I can’t say that I completed the challenge in full. There were some surprising discoveries and lessons learned along the way. There were days when I couldn’t go for a walk because after a week or so of gorgeous weather, we had a string of days of just rain, rain, and more rain. But that forced me to be creative and still get out of my house and be active. I wouldn’t call them walks, but I still counted it. 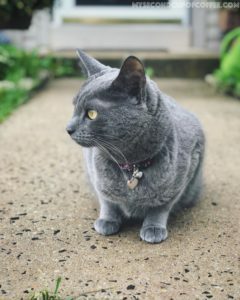 Even if I just went walking to the mailbox to get mail or walked my cat to the driveway and back, I was still proactively looking for ways to be outside. And that sparked a certain thrill! First, finding creative ways to NOT quit my walking challenge. And second, an excitement of finding grandeur in the ordinary of my days. Also, there were days when I simply did NOT want to go anywhere…I’m still having some rough days when my heart just isn’t in it, and life seems too complicated and dark. But I learned something from just the first week of continuous walking and being outside for half an hour each day. 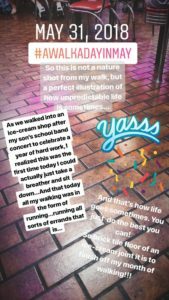 I realized that this walking challenge kept me feeling more alive and grounded than anything else I would do at home to break away from the sadness. Each day that started with a brisk walk gave me a boost of emotional energy for the day. For someone who struggles with seasonal depression, this was much more of an anxiety treatment than a fitness commitment. It also became apparent to me that a simple walk can really open your eyes to the world around you if you just make a point to look up from the pavement (or your phone). Our world is vast, exquisite, intriguing, interconnected, fascinating, and so insanely beautiful. Take it all in: God’s creation in its full beauty waking up for a new cycle of seasons. a realization that we all need to add a little bit of “white space” to our days. It doesn’t have to be long, but we all absolutely could benefit from some unmarked and unallocated time on our daily agendas. 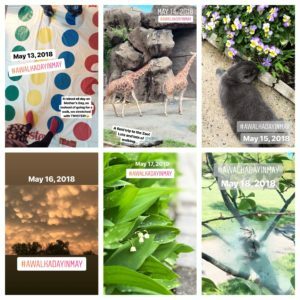 In our everyday life, we have grown so accustomed to rushing, getting things crossed off our lists, completing projects, and using every available moment for some sort of productivity. Our days are full. Whether they are full of truly good stuff that brings joy to others or just information junk that bogs us down, we often feel stuffed, but not satisfied. Make creating some good margins for yourself in your days a priority. Then, use that time to spend on your mental health: take a breather, take a nap, take a walk. Whatever it is that refreshes you, disconnects you from the busyness of your day, gives you positive energy and inspiration, try to do it daily! You will be amazed how much better you will feel on the days that you took that time for yourself than on those that you just hustled and hustled to exhaustion. Wether it’s a walking challenge or just a 5 minute break on the back porch, MAKE TIME FOR YOURSELF! 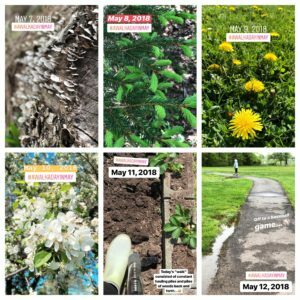 Here’s a recap of my 31 days of walking in May. It’s amazing to see the progression of nature’s awakening in the course of just one month, isn’t it? My walking challenge has now been over for a few days, and I can honestly say that I miss it. I’m pretty sure I’m going to put on my walking shoes tomorrow and hit the familiar trail. Not because I have to complete the challenge, but because I simply want to! 🙂 Who is with me? ?